Why We Must All Listen to this MotorBike Crazy Mystic! Who is the most inspiring person you have met in your lifetime? I must say I have been lucky to have met so many inspirational and wonderful people in the last 10 years. I have met and even worked with many spiritual masters, religious leaders, world politicians, business leaders and others who have touched me with the depth of their wisdom, the scope of their vision and their passion for what they believe in. And then there’s this motor-bike crazy mystic called Sadhguru! I first came across Sadhguru 6 years ago a Be the Change event in London – and I was immediately stuck by his humanity, depth and his zany sense of humour. If he wasn’t a world leader, I swear he could have been a comedian on Broadway! So what’s so special about Sadhguru? Sadhguru is the closest thing to an enlightened human being that I have met in my life. Sadhguru is a profound mystic, visionary humanitarian and prominent spiritual leader. He is also world class speaker and opinion maker who is widely sought after by prestigious global forums including the World Economic Forum, the United Nations, the World Presidents Organization, Tuck Executive Education, and TED, among many others. For me, the best and most charming thing about Sadhguru is that he is a speed demon! Given the chance, he races around like crazy on a motorbike or in a fast car, if and when his superhuman global schedule permits. 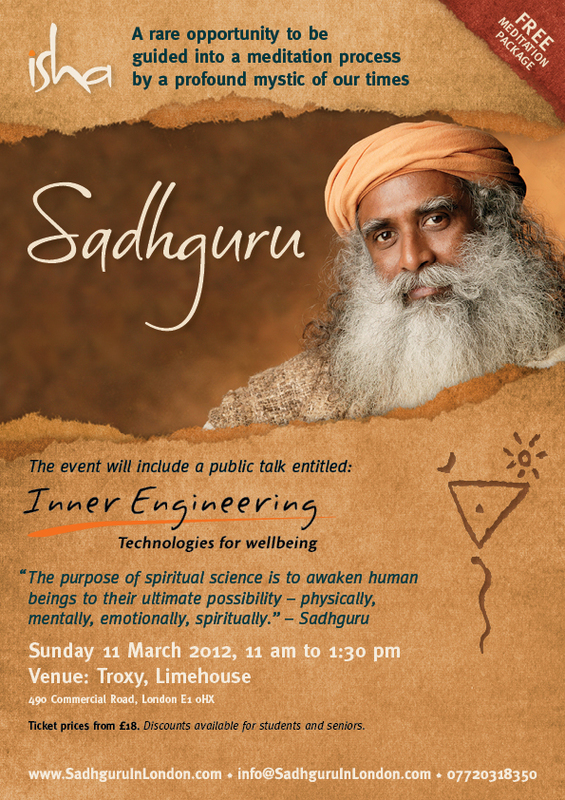 For those of you reading this inn email, check out Sadhguru’s TED Talk here. He has empowered millions of people in his native state of Tamil Nadu in India to plant millions of trees to prevent the land from becoming a desert within 20 years. Learn more about Project Green Hands here. An arresting blend of profundity and pragmatism, Sadhguru’s life and work serve as a reminder that inner sciences are not esoteric philosophies from an outdated past, but a contemporary science vitally relevant to our times. 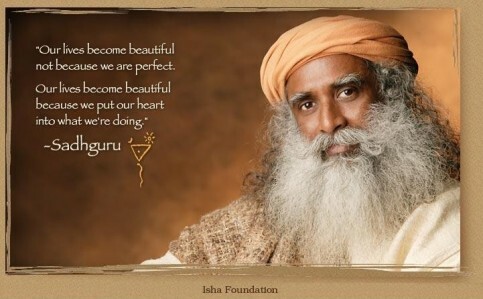 Over three decades ago, Sadhguru established the Isha Foundation, a non-profit, non-religious organisation dedicated to cultivate human potential. Today Isha Foundation has empowered over 7 Million Meditators and has over 250,000 Volunteers in 150 cities in over 10 countries worldwide. Sadhguru has a profound and urgent message for our time. The question is this – are we ready to embrace his wisdom and teachings? Oh and did I tell you that he also loves playing golf!? • Focus on all the beautiful things going on in the world. • We are not committed to our sense, but our senses! • At age 5, we have lots of moments of joy, by age 30 most people have long faces. • Aliveness does not go down with age! • The worst crime you can commit on this planet is to go around with a miserable face! • We think of people as things, not people. • In pursuit of our happiness, we collide with other people – this collision leads to conflict. • To be joyful is not the ultimate goal, but a fundamental requirement. • When a child arrives in this world, it is not a time to teach him, but a time to learn from him! • How many old faces of joy do you see? Learn to be joyous from the child. • Our currencies are different, but we all want to buy the same thing – happiness. • We need a solution to bring about positive change in the world, not a revolution. • You can contain happiness, you can’t contain joy! • Put your love, peace and joy on self-start, rather than waiting for others to push start you. • Be an expression of joy rather than be in pursuit of joy. • There is something in us longing to be a little more, to expand, to grow. Roll on forward a few years. I have now done Sadhguru’s Inner Engineering training, a profound and powerful experience which grounded me further and transformed my view of the world. Over 1 million people have completed inner Engineering and reported remarkable results. This training gives you simple tools to eliminate stress, relieve chronic diseases like allergies, diabetes and heart disease, sleep better, Increase energy and productivity, maintain emotional balance, improve relationships and communication and experience your life each moment to the fullest. Practitioners follow a 21 minute practice daily that aligns your mind, body, emotions and energy to function in complete harmony. Soon after this Inner Engineering experience, I put together my “Make It Happen” book which you can download here. 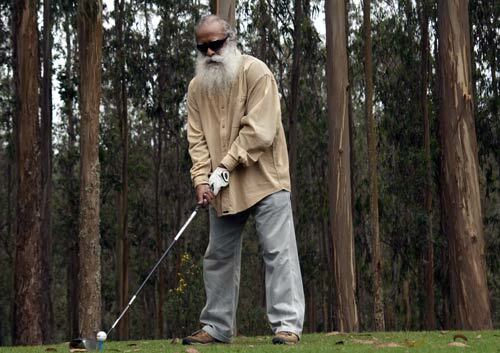 As you can see, Sadhguru’s teachings have profoundly affected and influenced me. If you ever get a chance to hear him speak live, you too would be equally impacted. Which brings me to tell you – Sadhguru is visiting London next Sunday, 11th March. This is an exceptional chance to experience Sadhguru live. And I kid you not – he’ll have you in raptures! As well as his talk, this unique event is a rare opportunity to be guided into a meditation process by the most profound mystic of our times. You can find out more and book your tickets here. 1. Is our Existence Created by What we Think? 2. The content of your mind is not your choice. 3. Suffering is self created. 4. How Do You Accept People You Don’t Like? 5. What happens when a person dies? For those of you able to attend the London event, I look forward to seeing you all next Sunday – I promise you that it will be a remarkable experience for all of us. For those of you not able to attend, check out the above videos and also check out Sadhguru’s message and his profound environmental work at Project Green Hands. Let us all strive to make the world a better place in our own way. You know it makes sense. 🙂 Feels great to read a post like this about someone I admire very much. I am a regular subscriber to the Isha Foundation blog and the insights are amazing – for all ages. Vidya, I had a feeling you would already know about Sadhguru! What an amazing being! And it’s so wonderful that he’s spreading his word as a ‘regular person’ who is approachable – gives his timeless messages a much better impact. I’ll be learning more about him. Thanks so much for the introduction Arvind! Paige, Sadhguru truly is an amazing being! Pat of his charm is that he is indeed so down to earth and just another “regular person”. Do check out all the videos and listed – and there are lots more on YouTube. Thank you, thank you, thank you Arvind! I loved this TED talk and have bookmarked this page so I can check out every link. Isn’t it great how the most enlightened people all have a fabulous sense of humor? Thank you so much for exposing us all to this wonderful man! Melody, I am so glad Sadhguru’s impish humour and inspirational wisdom resonated with you! Now you just have to come over to London next weekend and see him live :-). My husband and I just watching this together! It’s incredible!! I had never heard of Sadhguru before. I’m looking forward to learning more about it. Betsy, welcome to the world of Sadhguru! As more people around the world hear about his inspiring and heart felt work, it can only be a good thing. These are some great teachings. I have seen joy on old people. I think one has to spend time with them to really know that. Thanks for the joyful insights of your teacher! Tess, so true. Older people sometime have so much joy in them. But nothing beats the joy we witness in babies and young children. Oh to be young at heart again! Arvind, I wanted to thank you for posting about Sadhguru, I have seen (enjoyed) his vies once on DD National and could not remember his name properly. But his words were unforgettable. He told a story on DD that I still remember and even posted it on my blog.Although I used it another perspective(sorry) but the true meaning still gets through. Glad you liked my post about Sadhguru – his words are usually unforgettable!